Opened in December 2011, our Gerrards Cross store is our largest store, it has dog, cat and bird products on the ground floor, with a basement to house the fish, small animal and bird departments. It sells hamsters, as well as a huge range of tropical and Coldwater fishes and plants. You can buy online now and use our FREE delivery service to get your goods delivered if you live in the area. There is a large "pay and display" car park at the end of Station Road (opposite Waitrose) and a number of on street parking spaces along Station Road which are free for one hour. 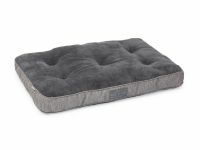 House Of Paws Boxed Duvet Gray Large 36"